Following a request by the European Commission, the Single European Sky Air traffic management Research Joint Undertaking - whose role is to develop the new generation European air traffic management system – has unveiled its blueprint to make drone use in low-level airspace safe, secure and environmentally friendly. This "U-Space" covers altitudes of up to 150 metres and will pave the way for the development of a strong and dynamic EU drone services market. Registration of drones and drone operators, their e-identification and geo-fencing should be in place by 2019. Today's vision paper is part of the Commission's drive to deliver on its ambitious Aviation Strategy and unleash the full economic potential of drones. This requires an effective legislative framework that can foster European leadership and competitiveness, while addressing a number of legitimate concerns, the first of which is safety. EU Commissioner for Transport Violeta Bulc said: "Drones mean innovation, new services for citizens, new business models and a huge potential for economic growth. We need the EU to be in the driving seat and have a safe drone services market up and running by 2019. The EU needs to take a leading role worldwide in developing the right framework for this market to flourish, by unleashing the benefits for key economic sectors." Safe: safety at low altitude levels will be just as good as that for traditional manned aviation. The concept is to develop a system similar to that of Air Traffic Management for manned aviation. Automated: the system will provide information for highly automated or autonomous drones to fly safely and avoid obstacles or collisions. Up and running by 2019: for the basic services like registration, e-identification and geo-fencing. However, further U-Space services and their corresponding standards will need to be developed in the future. the European Parliament and the Council (i.e. the EU Member States) are expected to adopt in the coming months. 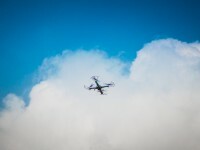 The Commission, through the SESAR Joint Undertaking, will finance a range of drone projects, focusing on the integration of drones into the aviation system. Finally, an expert group will be established to act as a sounding board for the further development of European drone policy. Delivering services in urban areas, collection of data for a wide range of industries, infrastructure inspections, precision agriculture, transportation and logistics are just some of the possible applications of this technology. The drone services market is expected to grow substantially. Estimates vary between €10bn by 2035 and €127bn for the coming years. A recent forecast predicts that by 2020 the global drone market size will grow by 42% in precision agriculture, 26% in media and entertainment, by 36% in inspection and monitoring of infrastructures, and by 30% for leisure activities. Current common European rules only cover drones weighing above 150 kilograms. Below this threshold, Member States are responsible to regulate. While national rules allow expertise to grow, they often diverge and cause a fragmentation of the EU internal market. Such fragmentation hampers the development of new products, the swift introduction of technologies and may also create safety risks. In December 2015, the Commission therefore proposed to create an EU-wide framework for drones as part of its Aviation Strategy. This requires the establishment of a regulatory framework, including standards, and the safe integration of drones into the airspace, on which today's blueprint delivers.